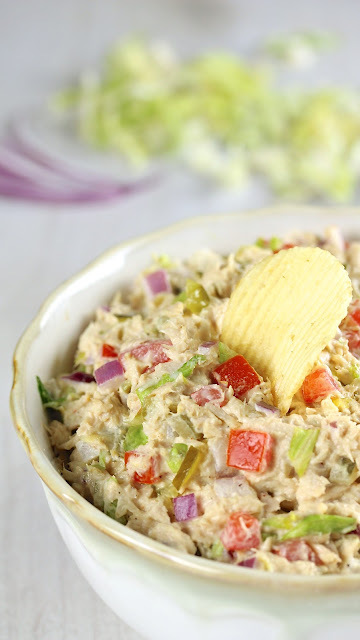 This dip is everything you love about tuna salad sandwiches (minus the bread) in a form of a dip. Served with crispy potato chips, it's a pairing made in heaven! ...I, Thao the food blogger, like canned tuna. There, I said it! Did I just feel my credibility as a food blogger take a dive? Please say no! I know there are a lot of canned tuna haters out there. 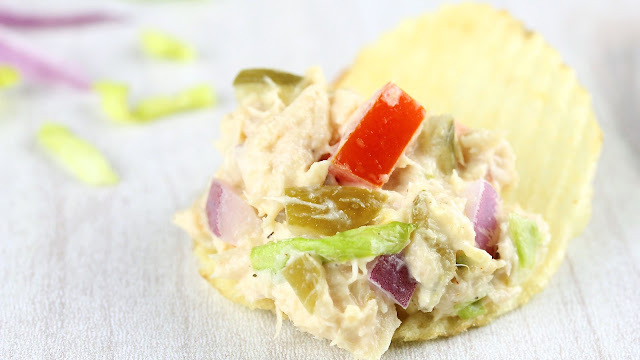 In the past, I refrained from making this post because, after all, who's going to want to read a blog recipe about canned tuna filling? Shouldn't I be talking about the virtues of using good quality fresh tuna? Well, maybe another day, but not today. Today is about simplicity and unpretentiousness, and this fish in a metallic container is both. Tuna is always in my pantry. It is an ingredient I use regularly. If it is not your thing, I understand if you tune out. But please some back real soon as you might find what I have in store in future posts much more appealing!! For the tens of readers who are still with me—let's move onto the dip, shall we? Now, it's pretty safe to say that the only way to eat a tuna sandwich or sub is with a fairly large helping of potato chips—some in the sandwich for that special crunch and a generous pile on the side. What I most love to do is to scoop up the excess tuna that cascades over the sides with the chips and eat it as dip. THE BEST dip for chips ever!! This dip has all the key elements of a proper tuna sandwich (minus the bread). It has the perfectly seasoned fish, the refreshing lettuce, the juicy tomato, the sweet/sour pickles (in the form of relish), and zesty red onions. Every bite is perfect. Every time. So I won't win any awards with this recipe, but it always makes me very happy. If you like tuna, and if you like chips but never had them together as chip and dip, it's time! Try it and you will see that I didn't steer you wrong. Are you a fellow canned tuna fan? What is your favorite way to prepare it? I'd love to hear from you! Use a fork to break tuna into flakes. Add remaining ingredients. Stir gently to combine. Serve with potato chips. 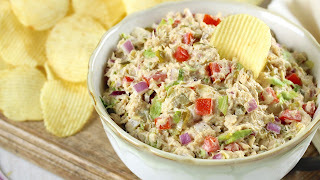 This tuna salad looks so pretty and delicious! 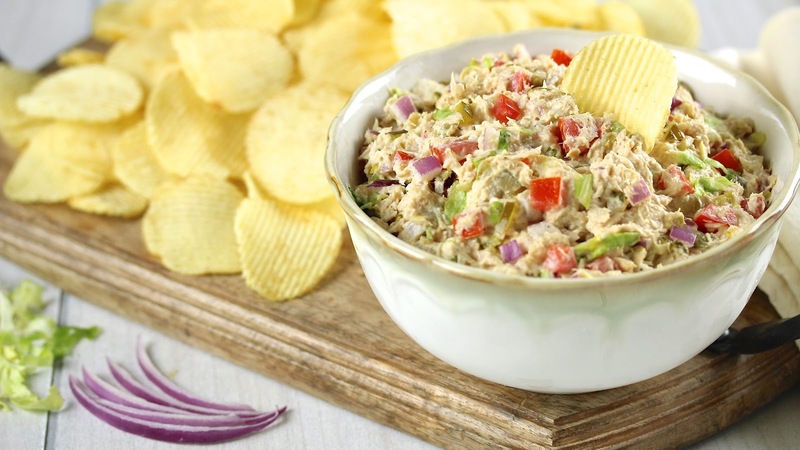 We love tuna and this sounds perfect for summer! Yum! I'm a canned tuna lover, too. In fact I made tuna salad this week for lunch! Your version looks wonderful---and I know I'd love it served with potato chips! Oh man - I LOVE canned tuna. I make a big bowl of tuna salad and it disappears quick in my house. My kiddo eats it with just about everything - her favorite is a sandwich with copious amounts of tuna and smashed potato chips on top. I love it with leafy salads for lunch. It's always good to be in company with another canned tuna lover! I love that our families see eye-to-eye on this all important food. 😉 As far as the Miracle Whip, I totally get your preference for all mayo. I love it as well, but I also like the slight sweetness and tang that the Miracle Whips brings. Heck, I'm easy and will eat tuna salad any way I can get it. OK, I have to confess I'm a vegetarian so my opinion might not count. But back when I still ate meat I loved tuna sandwiches (made with canned tuna). Fresh tuna is great too, but I don't see anything wrong with using canned! No credibility loss at all :). This dip sounds great! I'm a tuna lover. I usually make mine with onion,celery,mayo, & sweet relish. But I do like miracle whip so one day I would like to try your recipe minus the tomato. I don't like the taste of tomato & tuna.